Sea lampreys caused some of the most significant ecological changes in the Great Lakes. Once these biological invaders became established in one of the Great Lakes, population declines occurred in larger, deep-water species such as lake trout, burbot and the largest of the deepwater ciscoes — all preyed upon by the sea lamprey. These larger, deep-water fishes were also the primary targets of commercial fishing operations around the Great Lakes basin, serving as a major food source for the U.S. and Canada for over a century. The sea lamprey invasion negatively impacted commercial fisheries—many fishing families went out of business. 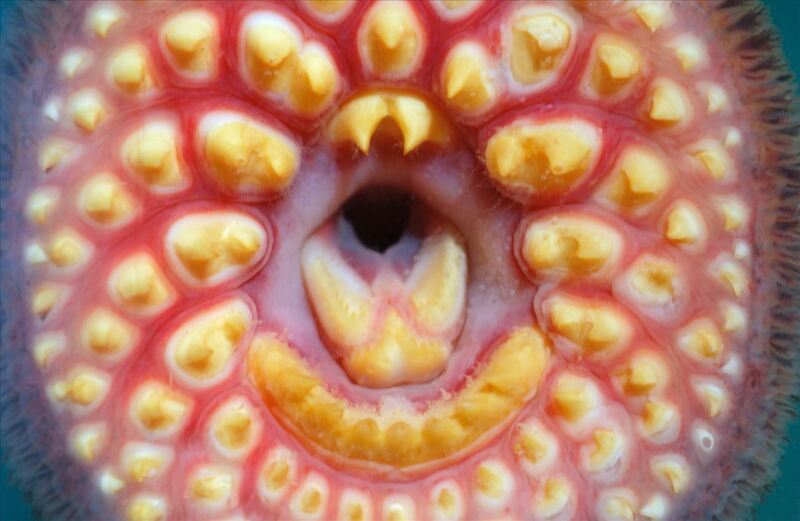 sea lampreys were so destructive that by some estimates, they killed more than 100 million pounds of Great Lakes fish each year—five times the commercial catch of lake trout in the upper Great Lakes! Sea Lampreys have since been controlled, not eradicated, and continue to be of concern in managing both commercial and recreational fish stocks today. The arrival and impacts of non-native species in the Great Lakes were first noted during the late 1800s. Sea lampreys were first documented in Lake Ontario in the 1830s, and by the 1880s, they had a negative impact on fish populations there. One theory as to how sea lampreys arrived in Lake Ontario is via several channel breaches during early construction of the Erie Canal. By 1921, sea lampreys were confirmed in Lake Erie shortly after the Welland Canal, which connects Lake Ontario to Lake Erie and bypasses Niagara Falls, was widened and deepened. During the next two decades, the invasive parasites spread to all of the remaining Great Lakes. In the 1880s, sea lamprey populations increased in Lake Ontario, in part because the increased water temperatures in streams (a result of environmental changes) were better suited for sea lamprey reproduction. Sea lampreys parasitically feed on lake trout and other fish, causing populations of these species to decline in Lake Ontario. 1954 – The International Convention on Great Lakes Fisheries establishes the Great Lakes Fishery Commission, partially to focus on Sea Lamprey control. 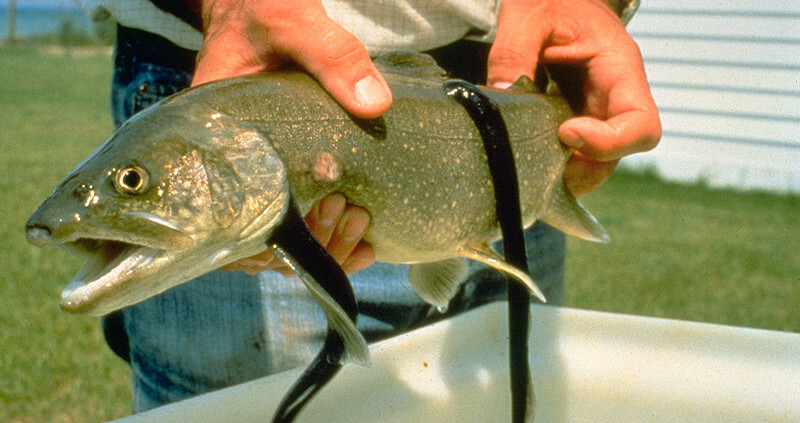 The effects of the sea lamprey worsened in the 1950s until the first control efforts with lampricides began in 1958. Over time, the Great Lakes Fishery Commission has become an umbrella organization for collaborative fisheries management in the region through its system of technical and lake committees involving a wide array of government, tribal and university scientists, agency managers and engaged stakeholders. The commission, since its founding, has provided a much-needed forum through which state, provincial, and tribal agencies can achieve consensus on management issues. The establishment of the commission created the sea lamprey control program. Several years of extremely intensive research — much of this work performed at what is now the U.S. Geological Survey (USGS) Hammond Bay Biological Station in northeast Michigan — led to the discovery of a chemical lampricide, called TFM, in 1957. The lampricide works effectively to eliminate the larval sea lamprey that live in sediments in Great Lakes tributaries, while minimizing impacts on other life in the streams and rivers. As a result, by the 1960s and 1970s, sea lamprey populations have been reduced by 90 to 95 percent in most areas of the Great Lakes. The sea lamprey problem had come under control to a large degree, allowing agencies to stock fish for restoration and recreational purposes. Instead of losing 100 million pounds of fish to sea lampreys each year, the lampreys kill less than 10 million pounds. By the 1980s, the Great Lakes Fishery Commission came to embrace the concept of “integrated pest management,” which entails using several control techniques in unison to achieve maximum success. 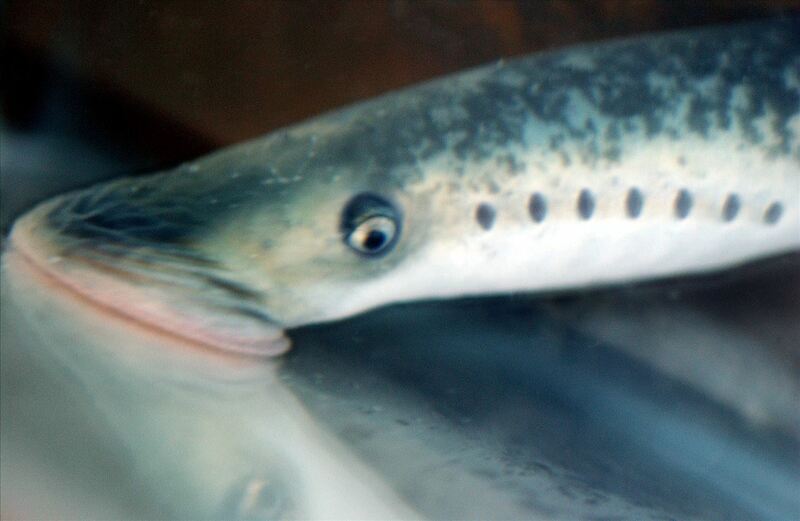 In addition to lampricides, for instance, the commission invested heavily in sea lamprey barriers, sea lamprey sterilization, trapping, and, most recently, pheromones as control techniques. Integrated pest management not only saves money, it also improves control. Today, sea lamprey control is a biological success story with a rich history, a model multijurisdictional invasive species control program that continues to innovate, and an ongoing obligation to keep the Great Lakes great. This trail story explores historic sites, science and management facilities relevant within the Sea Lamprey story. You can also visit one of many educational sites, interpretive centers, and aquariums where you can learn more about Sea Lamprey in the Great Lakes - and in some places, exhibits where you can experience live Sea Lamprey firsthand. A Sea Lamprey control site where you can view operations of a trapping station. Sea Lamprey science station for Department of Fisheries and Oceans (Canada). USFWS Biological Station engaged in Sea Lamprey monitoring and management. Federal agency conserving and managing fish and other acquaticc resources. Inland Seas Education Association provides water-based environmental studies and programs. Book exploring issue and implications of invasive species resulting from a series of locks, canals, and dams that opened the Great Lakes to global shipping. Video about invasive Sea Lamprey issue and management in the Great Lakes. 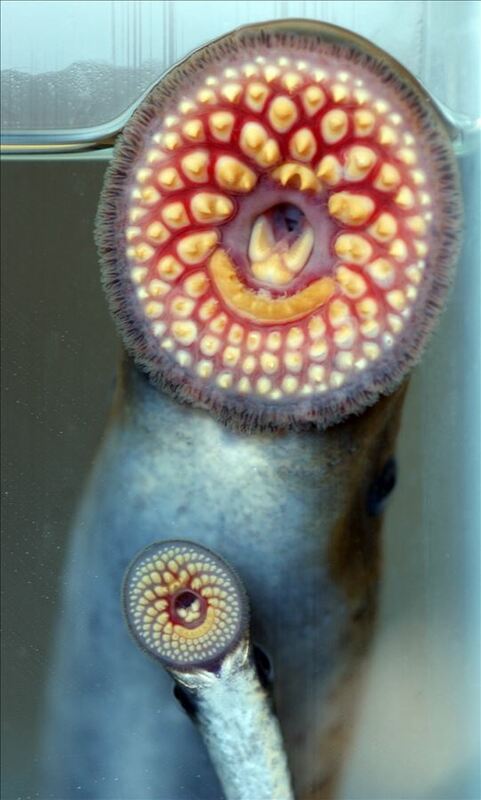 Fact sheet about control of Sea Lamprey in the Great Lakes. 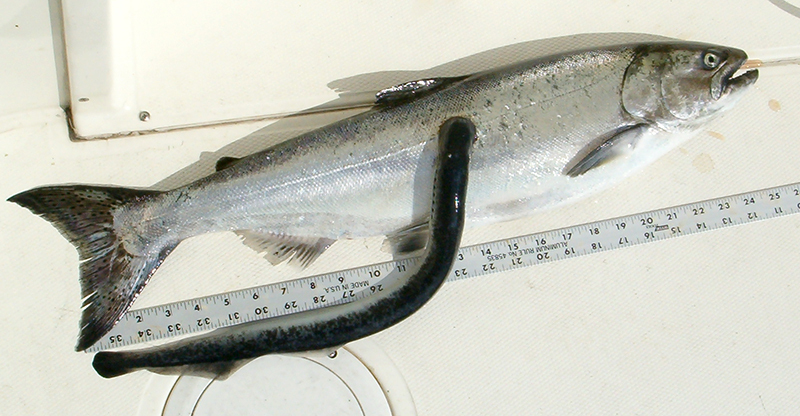 Fact sheet about Sea Lamprey ecology and issue in Great Lakes. Great Lakes Fishery Commission webpage about Sea Lamprey ecology, issue, and management in the Great Lakes. A fact sheet produced by Michigan Sea Grant (1997) exploring diversity of native, invasive lamprey species found in Michigan. Michigan Sea Grant’s updated third edition of The Life of the Lakes: A Guide to the Great Lakes Fishery offers a look at the colorful story of our Great Lakes.